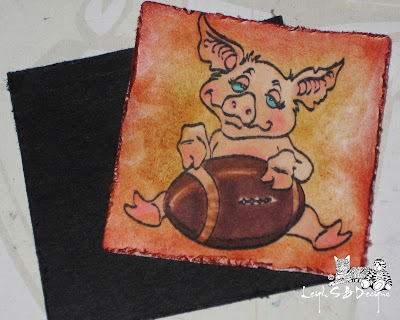 Velvet Paw Creations: "Say Oink Oink If You're Thankful for Football!" A Blockheads DT Project! 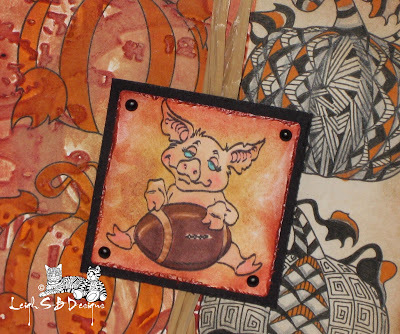 "Say Oink Oink If You're Thankful for Football!" A Blockheads DT Project! I designed this little cutie just for the guys and used the Pumpkin digi stamp and Naughty Pig rubber stamp available exclusively from Blockheads Paper Arts. 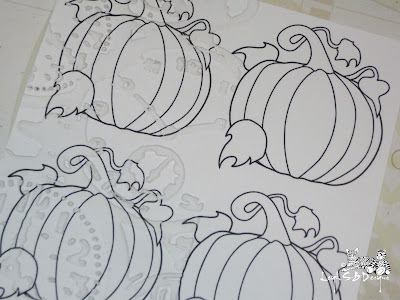 Lay out 4 digi stamp Pumpkins and print them out onto white cardstock. Die cut the panel out with a Spellbinders Square die. Emboss the left hand side of the panel with Tim Holtz' Pocket Watch Texture Fade. Mask off the embossed side with painters tape and apply Vintage Photo Distress Ink to the panel with an Ink Blending tool. Remove the tape and mask off the stained side and apply Tea Dye Distress Stain directly to the cardstock in a random fashion. Leave areas of white and apply more Tea Dye Stain with a piece of paper towel so that some areas aren't as saturated. 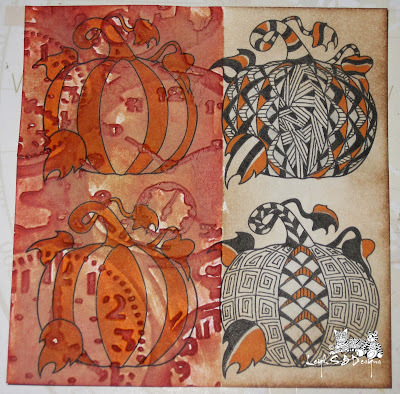 Apply Fired Brick Distress Ink to the just the embossed areas with a Ink Blending tool and remove the masking tape. Rough up the edges of the panel with a Tim Holtz Distressing Tool and ink up the distressed edges with Fired Brick Distress ink. 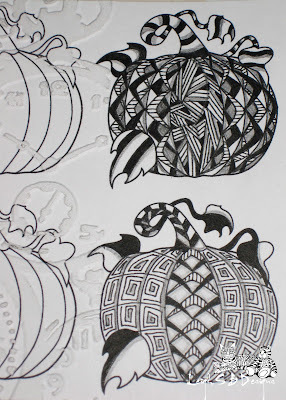 Add more pencil shading to the Tangled pumpkins. Punch tiny holes into all 4 corners and add tiny matte black brads. Wrap raffia around the panel along the dividing line and adhere in place with double sided tape. Stamp the Naughty Pig from the Naughty Pets collection onto Neenah Solar White cardstock with Memento Tuxedo Black ink. Die cut out the panel with a Square Spellbinders die and a slightly larger square from black cardstock. Colour in the image with Marvy Le Plume Permanent markers. Pig: R812 and R803, Football: OY848, E858 and E859. Colour the eyes with a Turquoise Prismacolor pencil and add background to the image with an Orange Watercolour pencil and blend with a Dove Blender Pen. Roughen up the edges on both the panel and the black mat with the Distress tool and apply Fired Brick Distress Ink with the Ink Blending tool. Adhere the image panel to the mat with double sided tape. Punch tiny holes in all 4 corners and add tiny brads. Make a folded card from black cardstock and adhere the large panel to it with double sided tape. 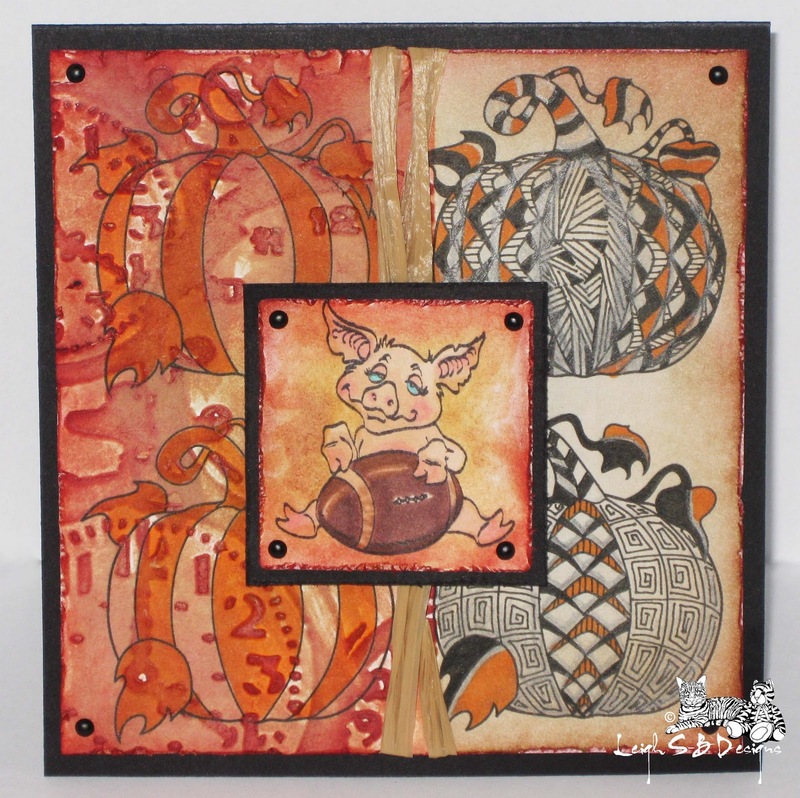 This little cutie fits the bill for this weeks Fall/Winter Challenge over at Mark's Finest Papers! Stay tuned coz I'm going to be getting all wintery with lots of seasonal creations!!! My team mate, Karen, has already started getting into the Christmas spirit so hop on over to her blog for a look see! Design Team Call for Blockheads Paper Arts! We're looking for 3 creative artists to join our amazing Design Team! Get the scoop on the DT details here! Such a cute idea!! Love the football reference. Very creative background!! The total color combination looks really nice. Fun idea! What a wonderful card! Love that zentangle!!! GREAT job!! Thanks for sharing at Speedy the Cat's Challenge1 Good luck! Awesome card!!! I love the tangle pumpkins! Thank you for playing along with us this week at Speedy The Cat's Friends Challenge. 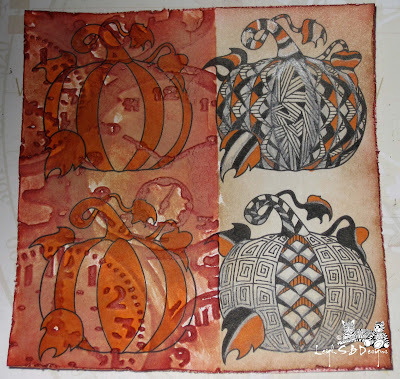 Your zentangle squares are fantastic! What a cool card!